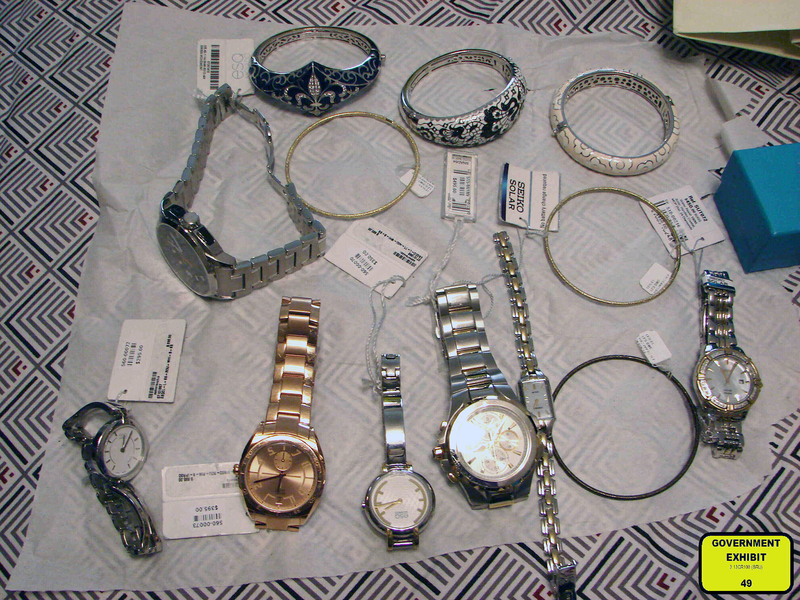 Watches and jewelry stolen during a 2013 Fairfield, Connecticut, robbery and kidnapping were recovered from the residence of one of the thieves in the robbery crew. Timothy Forbes was a career criminal who specialized in robbing jewelry stores. He and his crew had progressed from smash-and-grab thefts to what they considered a more reliable method: kidnap store employees and force them to provide after-hours access to the jewels. In the spring of 2013, members of the burglary ring conducted surveillance on employees at a Fairfield, Connecticut, jewelry store, going so far as to attach a GPS tracking device under one of their cars to learn where they lived. Around 9 p.m. on April 11, 2013, three of Forbes’ crew, wearing masks and gloves, forced their way into an apartment in Meriden, Connecticut, brandishing handguns. The terrified victims—two of whom worked at the Fairfield jewelry store—were bound with duct tape, and their heads were covered with pillowcases, towels, and jackets. The kidnappers then forced the jewelry store employees into a vehicle and drove them to the store while a remaining kidnapper stayed behind to guard the other victims. Forbes arrived at the store in a separate vehicle, and the thieves proceeded to steal jewels, watches, and loose diamonds estimated to be worth more than $3 million. After the robbery, Forbes notified his associate at the apartment, and the victims there and at the store were left bound as the criminals made their getaway and fled the state. The kidnapping and robbery had gone off without a hitch, and Forbes thought he had considered all the angles. What he failed to anticipate, though, was how an alert neighbor and strong law enforcement partnerships would undo his careful plan. When the victims were able to free themselves, they called the police. Meriden Police Department officers conducted interviews and did an initial neighborhood canvass the night of the robbery. A resident came forward with information he wasn’t sure was relevant but that “broke the case open,” said Special Agent Jennifer Berry, who worked the investigation from the FBI’s New Haven Division. The neighbor told police that one night nearly two weeks before the kidnapping, he noticed a suspicious silver car on the block with out-of-state license plates. One man was sitting in the driver’s seat, and another man was on the ground next to what turned out to be the vehicle of one of the victims. The neighbor dialed 911 but hung up when the suspicious car drove away. When the car returned 30 minutes later, the neighbor used a pair of binoculars to write down the New Jersey license plate number. He thought maybe the men in the car were buying or selling drugs. It was later learned that Forbes and one of his crew had been trying to remove the GPS tracking device from the victim’s car. Investigators quickly identified the silver car as a rental vehicle, and with that information identified the woman who rented the car. Through the phone number she used on the rental application, investigators were able to tie Forbes and his crew to the robbery and kidnapping. Of the more than $3 million in stolen jewels, Berry said, “very little was recovered.” Forbes and his crew—who had all grown up together in Allentown, Pennsylvania—were fond of gambling and high living. In January 2017, Forbes pleaded guilty to kidnapping, robbery, and the use of a firearm during the Connecticut robbery. Last month, a federal judge sentenced the 35-year-old to 19 years in prison. His crew had been previously sentenced to prison terms ranging from seven to nearly 15 years for their roles in the kidnapping and robbery.